When planning a wedding there are plenty of people ready with advice and suggestions. However, if you do not want a wedding just like any other, but instead a day of celebration that is unconventional, unique and totally awesome, follow our fun wedding ideas. You can incorporate more than one in your day, it is up to you. 1. Hire an artist to paint or draw the two of you at your wedding ceremony. It will be a great picture to hang on your wall at home later in the day. Alternatively, hire an artist to create insanely fun caricature sketches at your reception. 2. Instead of the formal dining or a buffet, serve your food family style. Whilst not all caterers off this style of dining, it is a more intimate way of dining that encourages conversation and interaction among guests. Great option for pot luck style weddings where you food ideas can be insanely broad. 3. Play life-size jenga on the lawn. Another way of encouraging interaction among guests, you can also ask your guests to sign a piece of the puzzle as a memory of your day. 4. Weddings can be long days, so to keep the energy levels up for the dance floor have a food truck at your evening reception. Whether you choose a burger or a taco van, your guests will be able to grab a snack and get back on the dance floor. 5. Prepare your guests for the morning after with a hangover helper kit filled with pain-relief tablets, a bottle of water with a customised label, mouthwash, mints and a granola bar. 6. If some of your guests are picky eaters, set up a variety of food stations at your reception with an ‘Around the World’ style menu. Pay homage to your ancestry by including food from your homeland. Peking duck is a traditional entrée at a Chinese wedding. Hochzeitssuppe is a broth-based wedding soup from Germany or the traditional wedding dessert from Vietnam, Banh Xu Xe which roughly translates to “conjugal cake”. 7. Weddings are emotional occasions for the leading ladies in the wedding party. To help keep the mascara in place, gift a quirky handkerchief with ‘No ugly crying’ embroidered on it. 8. 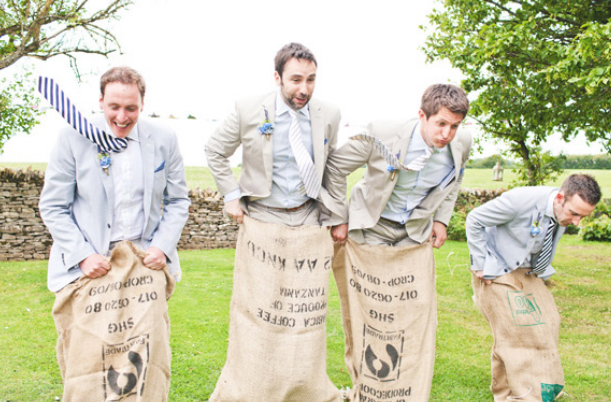 Instead of separate bachelor and bachelorette parties, plan a pre-wedding field day so your grooms-men and bridesmaids can get acquainted with one another. There are many traditional field day games that are fun for adults. Mix up the activities to include races, ball-based games and, if weather permits, water-based events. 9. Make sure everyone gets on the dance floor by adding a line on your RSVP cards asking for a DJ song request. That is going to make for an insanely fun mix of music ideas. 10. Have drink coasters made with the words ‘my two cents’ written on it and space for guests to write their own messages of support, love or advice to the newly weds. It is a great icebreaker for people sitting together who might not know each other that well. 11. When you leave the evening reception have sparklers ready to hand out to the guests as they form a double line to see you to your transport. This night-time exit makes for some great photo opportunities. It is like a time-capsule guest-book that you open on your first wedding anniversary.